CHERAW, S.C. — South Carolina Gov. Henry McMaster's flight over soggy parts of the state Monday turned from an observation trip to a rescue mission when he spotted two people stranded atop a flooded vehicle, surrounded by water rushing into the area from Florence. But, as the crew swung in for a closer look, McMaster and Chesterfield County Sheriff Jay Brooks — who joined the governor for a portion of the day to view flooded areas in his county — noticed that the men weren't on a raft but instead on the roof of what appeared to be a flooded pickup truck. "It's good they got out of the vehicle before the water came up too high for them to get out," McMaster said, noting it looked like water in the area had risen a foot or more since he and his crew had made their first pass and noticed the men. 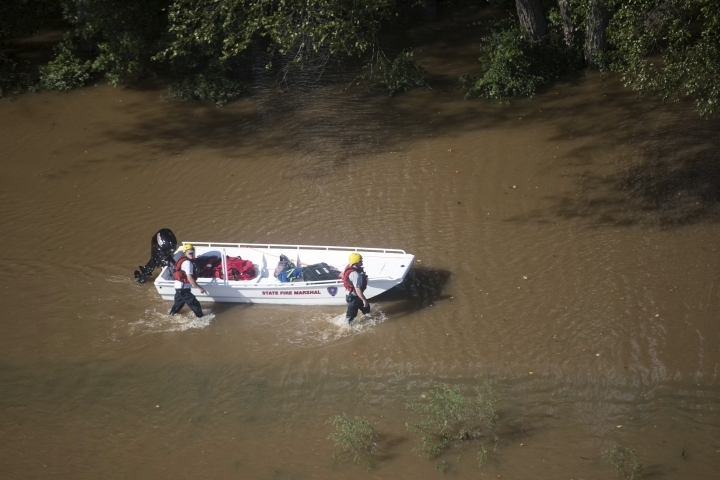 "Water was rising fast," Brooks told AP. "The truck stalled in the water and was swept into the trees." 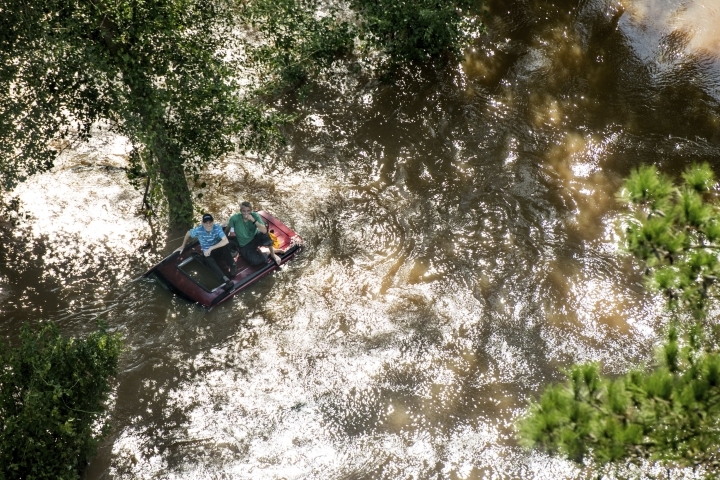 The aerial view was the governor's first of many areas of northeastern South Carolina, where residents for days have been watching and waiting to see how much the state's rivers would rise as they continue to fill up with waters flowing downstream from swollen banks in North Carolina. For a week, Department of Natural Resources Col. Alvin Taylor has warned about four rivers in northeastern South Carolina, an area known as the Pee Dee. All four rivers - the Waccamaw, Pee Dee, Lumber and Black - flooded in the torrent of rain that came along with Hurricane Matthew in 2016, in part because of the same system of intertwined rivers that flow into this state from North Carolina. During his fly-around on Monday, McMaster said he and state officials were doing what they can to learn lessons from 2016. That includes trying to shore up several roads leading to Conway, a city inland from Myrtle Beach, where officials say rising waters could cut off the area similar to what's happened to Wilmington, North Carolina. 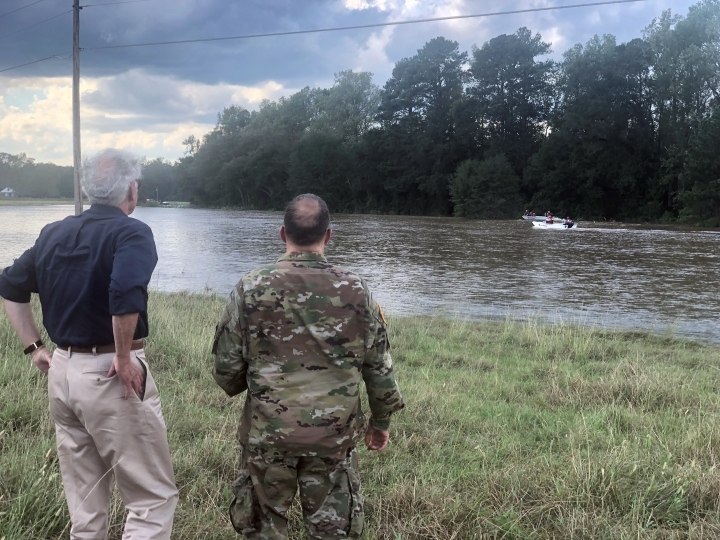 "The water is not finished," McMaster noted, gesturing to the flooded field that had spilled out onto the roadway and swept away the men's vehicle." You saw all that water in all those woods, there's water everywhere. That's what we're preparing for, and what we're ready for, is the worst case, and it looks like it might arrive."